Below is a brief description of what each type of class entails. The Technical Kickboxing sessions work through a syllabus of Kickboxing techniques methodically learning the mechanics of each move preparing the student for a grading examination where they can progress through the belts to Black Belt standard. The structured classes incorporate fitness and conditioning based warm up drills followed by a complete body stretch and finish with techniques performed in shadow boxing format then on to partner work and padwork to work on the techniques practical application. These classes will also feature self defence technique for street defence making it a very effective and practical art for an ever increasing violent society. These classes are aimed at all ages from 7yrs old and above. USKA Little Ninjas classes are aimed at children between 4 and 8 years old and are the perfect introduction to martial arts training and a great stepping stone to Beginners Kickboxing / Self Defence classes. The Classes run by our team of expert qualified Instructors and Coaches incorporate interactive and basic co-ordination skills with fitness, flexibility and concentration games along with basic Kickboxing technique and discipline in a fun hour long work out. Bring your Child along now to take part in the fastest growing and most effective FUN FITNESS WORKOUT around! 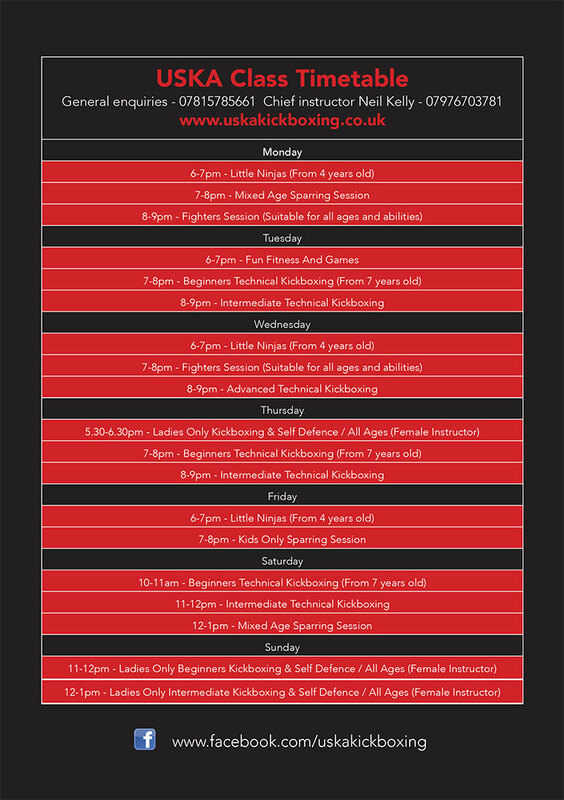 Our USKA Female division sessions are aimed at female students from the age of 6 years old and above. The sessions conducted in an all female environment and taught by a female instructor offer something for everyone. Whatever your goals our sessions incorporate Kickboxing and Self Defence and promote Confidence Building, Cardio work, Weight Loss, Body Toning, Body Conditioning, Strength Building, Flexibility training and Agility Training in a fully equipped Kickboxing gymnasium. We offer the the opportunity of progressing through the grading system from beginner to Black Belt in a non intimidating, safe and fun environment. Our Fighters Sessions cater for all ages and levels of ability and cover all aspects of Boxing training and fighting. Whether it's getting ready for competition or just training for fitness and fun this structured session is the one for you. The hour long Class will feature Shadow Boxing, Padwork, Bagwork, Footwork, Fitness, Strength and Conditioning, Head Movement and basic sparring drills and cover all aspects of the sweet science of boxing in detail all under the watchful eye of our Hall of Fame coaches. Sparring is probably the most important training aspect of being a fighter for both a Kickboxer and a Boxer. Our Sparring sessions are where you can put into practice everything you have learned in a controlled environment against your team mates. This is where you actually learn to fight. You get to see what works and what doesn’t. You find out exactly what needs to be improved on and under the guidence of your coach get to work on new things and make adjustments. If sparring is required for your next grading this is also the sessions that you can get your practice in on. This class is predominantly yet not exclusively aimed at children with the focus being on at getting fit while enjoying themselves in a fun and friendly environment. The classes are game and goal based promoting a healthy competitive nature and at the same time encouraging social interaction and an understanding of fair play among the other participants. The fitness aspect of the class promotes weight loss and general fitness with races, skill based drills and dodge ball featuring highly within the session.